Seething with anger due to poll alliance with the Sanmilito Gana Sakti in Jonai, irate BJP workers attacked the residence of Jonai district president and pelted stones on Sunday. 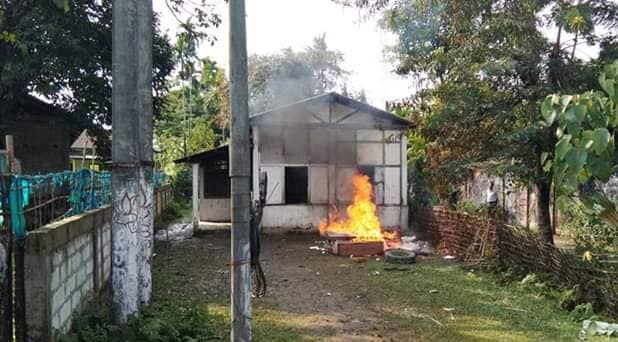 Seething with anger due to poll alliance with the Sanmilito Gana Sakti in Jonai, irate BJP workers attacked the residence of Dhemaji district president and pelted stones on Sunday. The residential building was partly damaged in the mob attack. But, fortunately the district BJP president and his family members were not at home during the attack. CRPF and police rushed to the spot and dispersed the angry mob to bring the situation under control. Nobody has been arrested in this connection. Earlier, deprived BJP members gheraoed Lakhimpur MP Pradan Baruah and district BJP president Rupa Kaman at a hotel in Silapathar on November 11. The dissident members also vandalized two BJP mandal offices in Jonai and burnt down party flags and other office materials. The saffron party members are infuriated over the fact that their party high command in the name of pre-poll alliance with regional party SGS and handed over all panchayat seats in Jonai block to the new ally. Terming poll-alliance “imprudent” and “pessimistic” act of the party bigwigs, the dissident BJP workers alleged that party high command is disgracing the dedicated BJP activists, who have been working in the party for last several decades. When contacted, district BJP president Rupa Kaman said the decisions regarding poll alliance was made by state BJP committee and she had nothing to do in this regard. “Some party tickets were wrongly issued by district committee to contest the poll which BJP state committee rejected in the wake of alliance with SGS in Jonai block. The state committee also issued a letter to district election department for disqualification of BJP nominees who have filed nominations papers with BJP ticket in Jonai block”, the district president said. Meanwhile, Dhemaji district BJP committee informed state BJP functionaries about the situation. The leaders also informed the incident to chief minister Sarbananda Sonowal and urged him to ensure adequate safety and security to the district level BJP leaders until the situation is brought under control.